Bambi just arrived from the Birmingham Race Track. 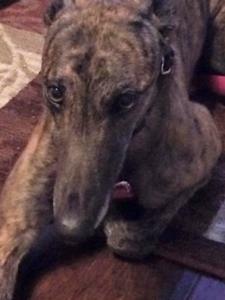 She also raced at Palm Beach, Mobile, Derby Lane and Ebro. She was a good racer competing and winning at the top A level with 113 races to her credit. She even won four A races in a row. Her last race was an A race and she won it! She passed her cat test at the track with just a little interest at first. She lost interest quickly and corrected well so they felt she was very workable with cats. Bambi raced at 62lbs. Her sire is the very famous Kiowa Sweet Trey and her dam is Dawn Broke. More as we get to know her.